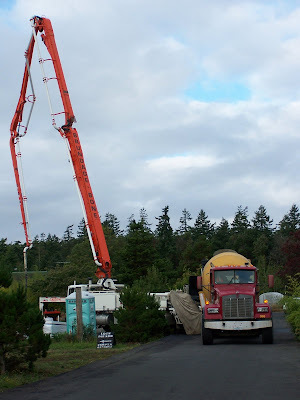 Because Port Townsend is in an earthquake prone area, the foundation needs to be solid and the house needs to be firmly attached to the foundation. 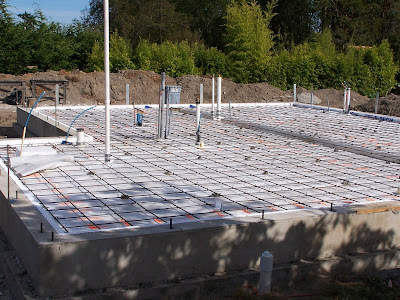 From an energy conservation point of view, the slab and foundation are often not optimally designed. Concrete is quite a good conductor of heat, and if the foundation is in good contact with the earth and the house is in good contact with the foundation, you have the potential of a significant heat loss. One possible design is that of a thickened slab in which the edges, which support the walls, are thicker. To integrate this design into a passive house, you would need to put foam under the entire foundation. That design has been approved by a Seattle structural engineer, which means that we could do it here. However, I am not confident that there will not be microbes that will degrade the foam over the lifetime of the house - at least 100 years. Therefore, I'm building a tried and true footing and stem wall that are in direct contact with the earth and a separate slab. The footing and stem walls support most of the weight of the house. 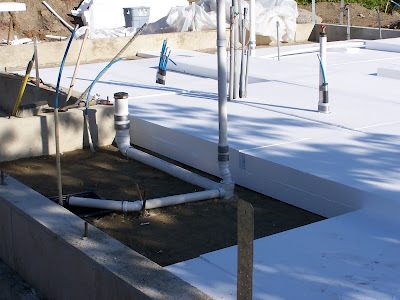 There is 10" of underslab insulation to cut heat loss to the ground, and additionally, there is a 2" foam-filled gap between the edges of the slab and the foundation stem wall. There are pluses and minuses to this design. On the positive side, you have stability and confidence based on at least a hundred years of experience that the foundation will be stable. 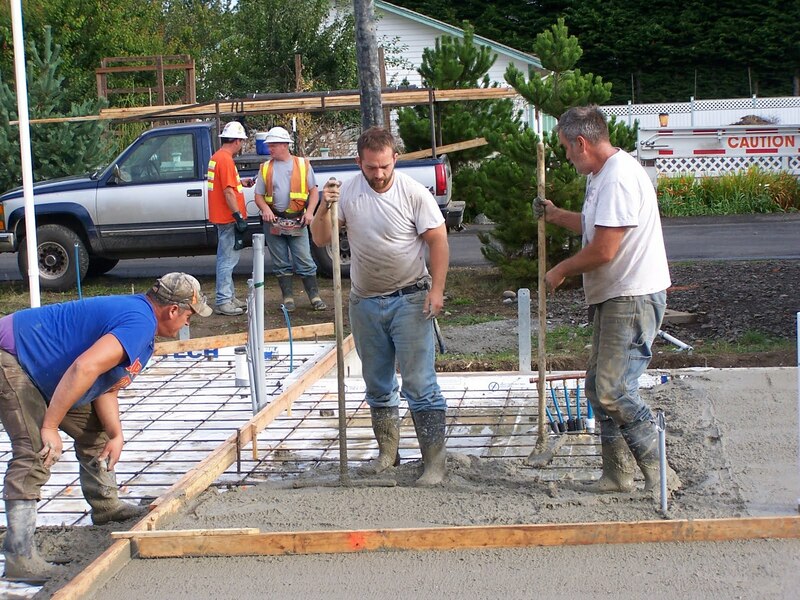 On the negative side, the expense is higher because construction requires 3 pours instead of one, more form construction, and more time to build. The first image shows the 10" of foam under the slab and the second image shows the rebar in place. There is a vapor barrier between the foam and rebar. The shaded area in the second image is where the slab will be thicker to support the weight under the ridge beam. Here we have no way to avoid having the foam under this portion of the footing. 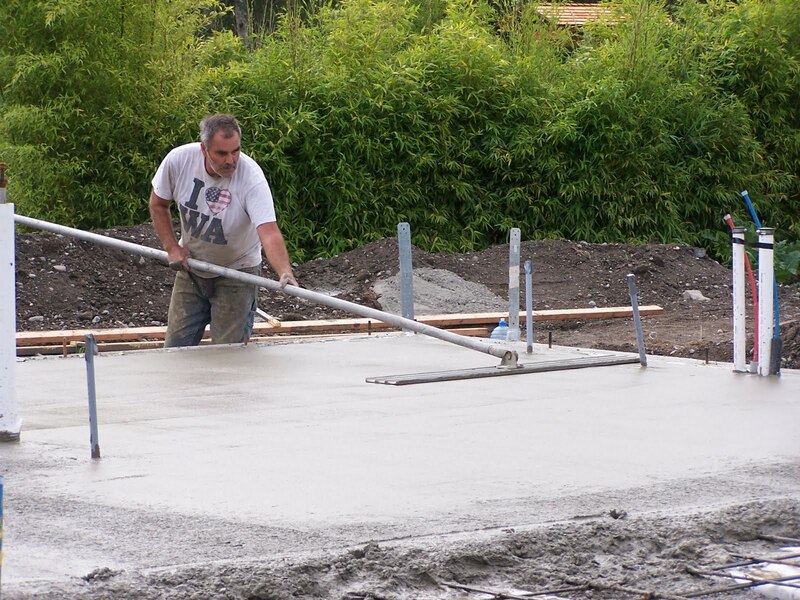 We're ready for the concrete! From top to bottom: Note the 2 x 4 on stakes in the image. 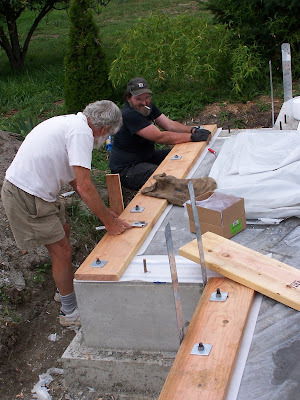 The stakes go through the insulation into the ground and the top of the 2 x 4 gives a reference level for Hans and his coworkers to ensure that the slab is flat and level. Successive 2 x 4s are pulled out as they work their way across the slab. 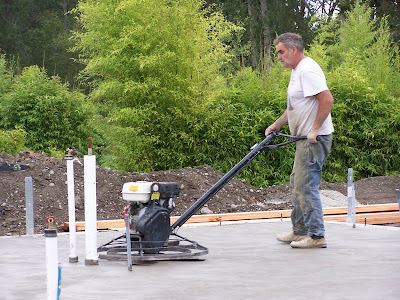 In the second, third and fourth images, Hans is using the bull float, a hand trowel, and a power trowel as the concrete hardens. 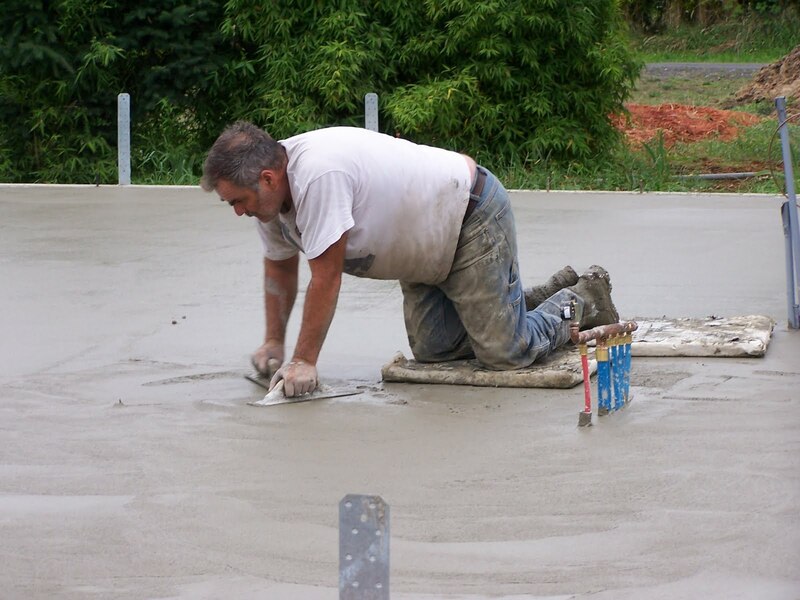 When they are done, the top of the slab is flat to within 1/8" over 8' and is nearly polished. The foundation cost $18k, and the ground work which includes excavation, foundation and gutter drains, driveway construction, backfill and perimeter grading, will cost ~ $10k. So we are up to $28k before the walls go up. 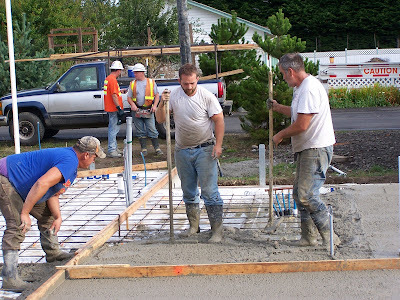 The added expense for the passive house over a conventional house at this point is ~ $2k, assuming the same type of foundation as opposed to a thickened slab. 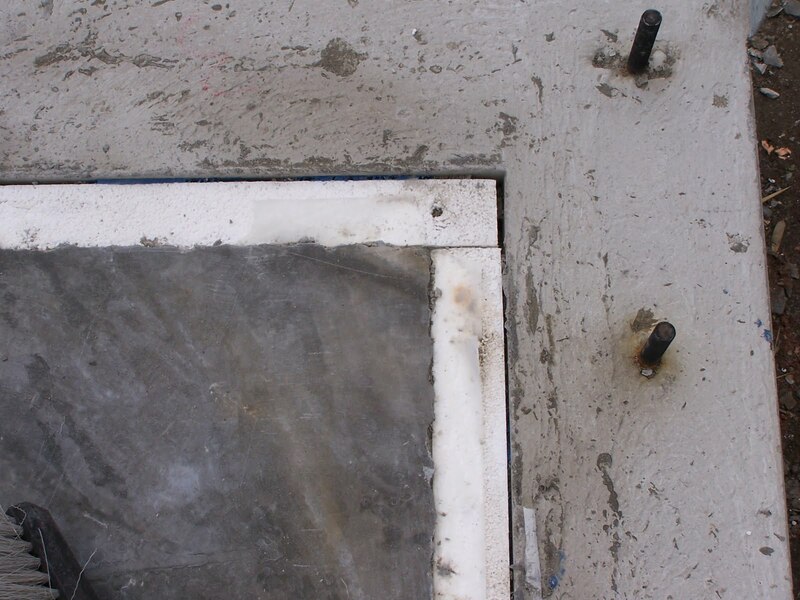 The top image shows the foam insulation between the slab and stem wall. The bottom image shows Charles and Mike installing the sill plate over a thin foam layer (Sillseal). 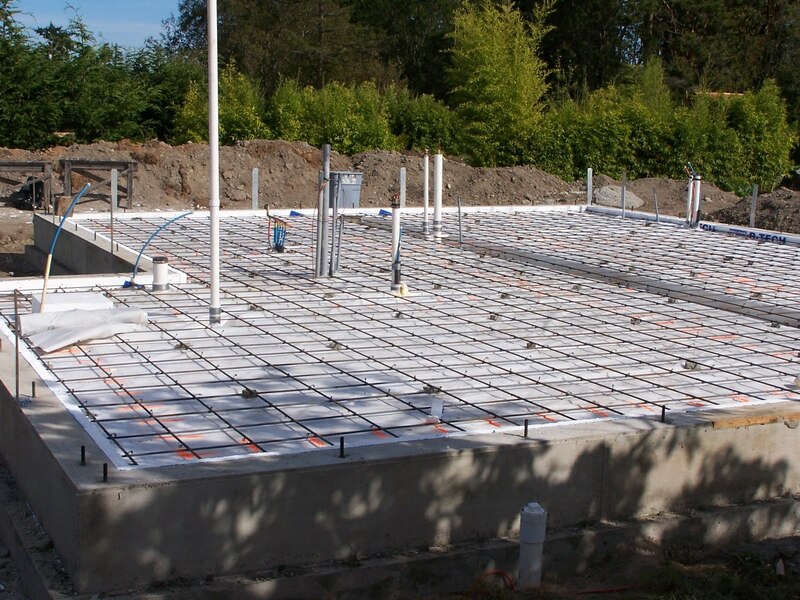 Keeping air leaks to a minimum is a critical step in passive house construction. To make up for any roughness on the top of the stem wall, there is a bead of mastic between the concrete and the Sillseal. Where are we in terms of schedule? Through footing and stem wall construction and plumbing and electrical ground work, we were right on schedule. By the time we poured the slab, we were 6 days behind schedule. The delay was mainly waiting for inspectors and one or two days of bad weather. At this point, we have to wait a week to get the wall panels because of delays in getting agreement on the final design of the panels between the architects and the Sips manufacturer (Premier). If the panels arrive on 9/20 as planned, we will be 11 days behind schedule, where the work week is 5 days.